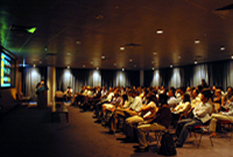 In 2002, the Transnational Tanteidan Forum started in Tokyo, moved to Europe and the US, and, now in its fifth year, the forum was held in the tropical island-city of Singapore. Once again chapter members gathered for the yearly event to get reacquainted and share lighting experiences. The theme this year was façade lighting. The façade, said to be the face of architecture, is sensitive to light at night. Illuminations can add to a building’s charm and highlight it’s features, but can also leave a damaging expression. Architecture, the face of a city, creates a nightscape unique to each city and area. How façade lighting affects the nightscape of a city was the topic of this year’s forum. 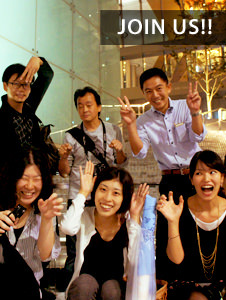 The night started with our top presenter, Singapore member, Ms. Toh Yah Li. 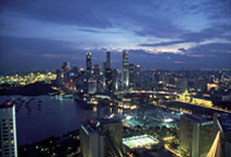 Yah Li introduced the different areas of Singapore, focusing on the CBD district and the skyscrapers along the waterfront. The reflection of this group of skyscrapers in the bay is distinctive of the Singapore nightscape, but the light permeating from the windows of high-rise public housing is also a classic view of Singapore. Next on the program were Hamburg lighting designers, Mr. Christof Fielstette and Ms. Ulrike Brandi. The pair presented on the illumination of the city hall and other historical buildings with classic stone facades, but as a city situated on the waterfront, the relationship between light and water was another point of discussion. Ms. Aleksandra Stratimirovic, formerly of Belgrade, Serbia, but now traveling between Stockholm and Belgrade, presented this year for the first time on her hometown. With many connections to architects and designers in the area, Ms. Stratimirovic, has started Lighting Detective activities in Belgrade. Her presentation included many images of a neat little town, with no hint that the country has been a battleground for many years. While there are areas of shadowy darkness, many of the main buildings are intensely illuminated in bright white light. Lighting Detective members are anxious to see how this city will be transform. In conjunction with the forum, the Lighting Detectives also held and two-day workshop, “Searching for Heroes and Villains of Light.” Singapore, was divided into 5 different areas for surveying, including: ①Toa Payoh, a new and emerging residential area ②Orchard Road, Singapore’s main street ③Bugis, a cultural melting pot ④the charming waterfront along Singapore River ⑤the red-lantern dotted, Chinatown. Even though Singapore is a small island-city, many unique communities are alive in this urban area. After a full day of surveying, each team organized their data into two groups: Heroes—good light and Villains—bad light, and, along with analytical comments, laid-out on panels for presentation. In conjunction with The Urban Redevelopment Authority of Singapore, “Lighting up our City Centre” a lighting master plan for Singapore’s city center, designed by Lighting Planners Associates (LPA), was on exhibit at the URA Centre during the forum. Running from November 22nd , 2006 through March 28th, 2007, the exhibit explores options to create a signature nightscape for this tropical city and lays out distinctive guidelines for four main districts; Orchard Road, Singapore River, Bras Basah Bugis, Central Business District (CBD) and Marina Bay. 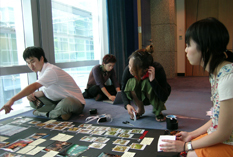 The exhibit was also a prime opportunity to introduce the Lighting Detectives to the residents of Singapore, with one corner or the exhibit room focused on their activities. Ms. Katja Bülow presented Copenhagen, a city very protective of historical buildings and with strict laws governing facades and signage, a tactic to preserve the beauty of the city during long Scandinavian nights. Mr. Kaoru Mende, of the Tokyo Chapter, presented the Tokyo nightscape in three categories: commercial, residential, and offices. The intensely lit facades from various districts in Tokyo, Ginza, Omotesando, Akihabara, Shinjuku, and Asakusa, dwarfed the other cities in the sheer amount of light produced. After the individual presentations, Dr. Erwin Viray, assistant professor, Department of Architecture, National University of Singapore, moderated the panel discussion. European participants were most surprised by the amount of direct sunlight in Singapore. In northern Europe, they are constantly faced with the challenge of how to incorporate more light into buildings, the opposite of Singapore, where they continually seek shelter from the intense sunrays. Again, geography plays a huge role in the lighting culture of each city.